The prime duty of all the angels is the adoration of God, but as we know, they serve God in many ways. To refresh your memory, or to learn more, about this wonderful creation of God, please see our new Angels page in the Catholic Devotions section of our website. As well, you will find enlightening and encouraging several books we offer: Devotion to the Nine Choirs of Angels, St. Michael the Archangel, and The Guardian Angels—our Heavenly Companions. 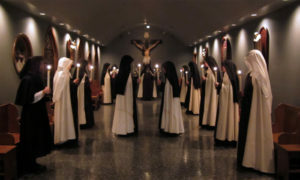 Carmelites have always had a special devotion to the Angels of God, stemming from their obligation, which is that of all religious, to imitate their virtues and unite their prayers, especially their liturgical prayer (Holy Mass and the Divine Office) to the perfect prayer of these adoring Spirits. There is also the old story, handed down for decades—and maybe centuries—of the special angelic protection given to a Carmel which was the target of robbers’ plotting. Night after night, when the robbers arrived at the monastery gate and walls, they could not enter or break into the enclosure. Something held them back. Giving up in exasperation after weeks of frustrated attempts, the robbers one day actually rang the visitors’ bell and confessed their intended crime. Puzzled, they asked the surprised nuns who the four intimidating men were, guarding their monastery, for each night they would see men, attired in strong armor, each one guarding one of the four corners of the enclosure. Then the nuns knew their devotion to the Angels was rewarded by the apparition of these formidable protectors—God’s own protection through His loving servants, the Angels! Angels help us in all sorts of ways, and we should work with them in every event, every moment of our days. Our very wise priest has told us many times over the years that when he must speak to anyone, especially to give counsel or spiritual direction, after asking the guidance of the Holy Spirit, he never fails to ask the help of his own and the individual’s Guardian Angel. How fruitful this practice has been for him, all of the Sisters here can testify, for we are blessed beyond measure with the surest of guidance in the spiritual life. May all priests find God’s help, light, and peace through their Angels! The infant child of dust. Those of you who visit our website often have, no doubt, noticed the “spiffing-up” being done over the last few months. Refreshing the appearance, re-organizing the gifts and sacramentals we offer, adding new and beautiful items—all of this and more is the work we share with our website builders/administrators. We’ve all been busy here! A few new items include Italian silver plaques and rosary boxes. One of the pieces is a large, framed depiction of the Last Supper—a perfect gift, we think, for a wedding, or especially for a priest—either for an ordination gift or other occasion. Although it’s early to be thinking about Christmas, it is the time to be preparing for Christmas. It is best to order early for the exquisite wood-carved Nativity pieces. We have been told that the Italian woodcarvers start working almost exclusively on nativity figures in early September—and don’t stop until close to Christmas Eve! We’ve received many compliments on these devotional Nativity sets—from church groups and religious communities to young families. Our selection of Christmas cards is also now “up”, and how pleased we are to see that companies still strive for excellence in the production of beautiful religious cards, especially ones that portray the Virgin and Child. It is our joy each year to provide for and encourage the sending of this loveliest of images all over the world, to proclaim the true event of Christmas… Not only children, but folks of all ages, love to keep the Advent traditions before Christmas—even opening the little windows on the Advent calendar! We have three new Advent calendars and of course, the Advent wreath and candles. The new 2011 Liturgical Calendar is also now available. Year by year, we add to our much-loved relic badges, since we are privileged to have inherited a good number of first class relics of the Saints. The St. John Vianney relic badge is our latest addition. We know it has been too long since we have sent news of Carmel (6 months! ), but our full days have the homespun about them, so there is nothing earth-shattering to share—just the little events that convey God’s blessings, trials and graces, day in and day out. We had a Clothing ceremony at the end of June and are busy sewing and preparing for another Clothing this month. Please keep these young vocations in your good prayers. We added a much-needed sewing table to our sewing room—and it was quite a feat getting the over 200-lb crate up a long flight of stairs to its destination! We are canning up a storm as the harvest comes in. The farmer’s market again is our source for the good and simple food of Carmel. 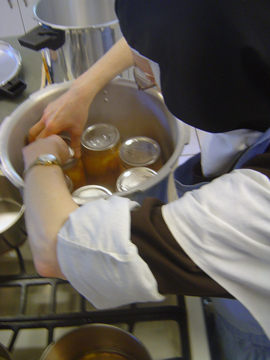 Two generous Sisters, in particular, have taken on this heavy and demanding work, and we have three big canners for the purpose. One day last week, they made applesauce and our “Sister-of-the-Thumb” peeled apples all morning. We call her that because her hands are strong from working hard all her 60+ years, and she has a thumb that is uniquely powerful for accomplishing tasks that many of the rest of us wouldn’t attempt. Sister knows perfectly well that there are tools to make peeling apples easier, but nothing doing! On September 14th, Feast of the Exaltation of the Holy Cross, we renewed our vows, as we do each year on this date, as well as on January 6th, the Feast of Epiphany. 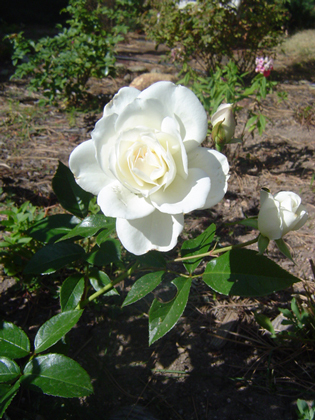 Our Holy Mother St. Teresa specified these particular feastdays for this renewal of loving fidelity in the year. She chose fittingly, since Our Savior’s humility and glory are equally celebrated on these feastdays of the Church. Without the “foundation virtue” of humility, there is no true and lasting vow, and without appreciation of the dignity of these precious promises to God, we cannot make them fittingly and worthily. On the humble side, one of the most indispensable things the vows teach us is our need for God—for His loving Providence and His continual Divine help. The “glorious” side of the vows is the inestimable privilege of belonging wholly to God as a bride of Christ. These all-encompassing promises shape and touch every moment of our lives—from the time we place our hands in the hands of the Prioress for the first time, until the Profession crucifix is placed in those hands at death. Each time we renew our vows, Our Mother Prioress tells us not to expect much from the little talk she will give, as the ceremonial requires Her Reverence to make. So busy and full are Our Mother’s days that we understand her saying this, since it is never easy for her to take time to prepare something to say. But we all give one another knowing glances, perfectly familiar by now with how the Holy Spirit speaks through His instrument, our Prioress. The less prepared she is (or thinks she is), the more evident it is that the good Lord tells us all He wants us to know through Her Reverence. 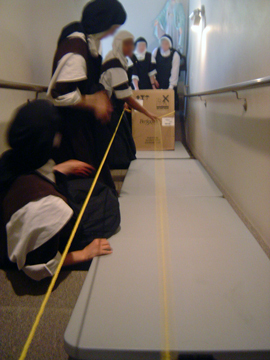 Another cause to rejoice in being a Carmelite! Before closing this long (and long overdue) newsletter, we wish to acknowledge the good friends who administer our website—dedicated Catholic men who assist us in this work for the love of God. This and each newsletter comes to you through their labors for Carmel, and God alone knows the abundant reward in store for them. And so we close with assurance of our prayers. May the Angels guide and protect you!